Let Best Shot's 3-Step system work for you! Ultra Plenish conditioner provides custom conditioning where it is needed most. Excellent for dematting, detangling and deshedding. Protein enriched with silk amino acids for full body and shine. Refreshing herbal scent. Works as Step 2 in conjunction with any Best Shot shampoo (Step 1) and Ultra Vitalizing Mist (Step 3) to wrestle tangles, mats and static. Using Best Shot as a 3-Step System safely releases more shedding undercoat as you bathe. Enables a High Velocity Dryer to virtually replace most of the brush-out, minimizing coat damage! Dilutes 3:1 for matted coats, otherwise up to 5:1. 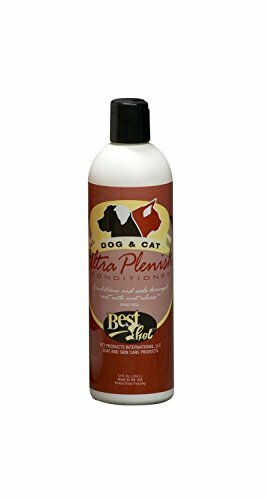 Safe for Dogs, Cats, Puppies and Kittens. Regular use enhances coat health and appearance. Available in 16 ounce and gallon size. If you have any questions about this product by Best Shot, contact us by completing and submitting the form below. If you are looking for a specif part number, please include it with your message.